Speed dating -- it happens all over the world. 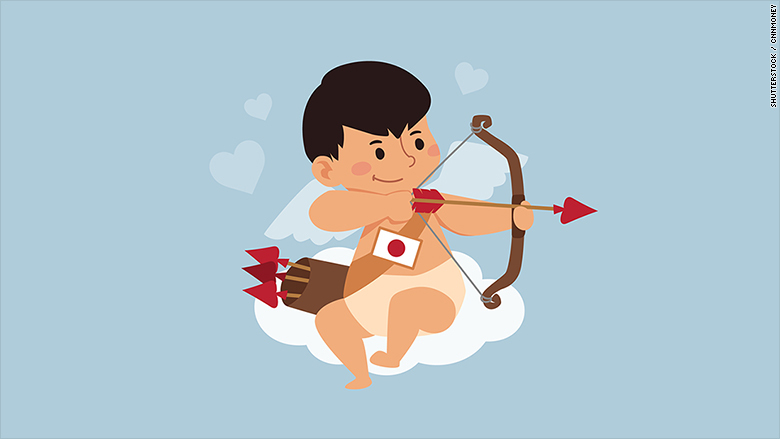 But what's different about Japan is that the government is the one playing Cupid. Officials desperately want more women to work to boost the country's stagnant economy. But it also wants them to have more babies to reverse a long-running decline in the birth rate, one of the lowest in the world. That's led to taxpayer-financed dating services in places like Ishioka, a town about an hour outside Tokyo. "When you think about how to prevent a decreasing population, nothing starts without marriage," said Kazuhiko Suzuki, an Ishioka city official. At a recent "konkatsu," or "marriage-hunting," event, nearly 80 single men and women buzzed around the room trying to gather as many answers as possible to a list of icebreaker questions like "What is your favorite food?" Then came speed dating in small groups so they could get to know each other better. And whenever anyone got too shy, elderly volunteers from a local "marriage-promotion committee" would step in to guide the conversation along. Nozomi Abiko, 22, who works at a local bank, came to the event after her boss gathered all the single women in the office and suggested they attend the annual dating event. "We couldn't say no to him!" she said. As it tries to revive its sputtering economy, the Japanese government hopes women like Abiko will pursue their careers at work and also have plenty of children. The world's third-largest economy is in dire need of more people: Japan's population shrank by one million to 127 million in the five years through 2015, according to the World Bank. But Prime Minister Shinzo Abe's efforts to bring more women into the workforce are falling short. Challenging traditional gender roles can be an extremely unpopular move in Japan, where many people still support the idea that a woman's place is at home. Many of them "strongly believe that encouraging women to work reduces the birth rate, and leads to more divorce," said Machiko Osawa, a labor economist at Japan Women's University, who has long championed women's rights. "That is one of the reasons why many politicians are reluctant to promote women working outside [the home]." 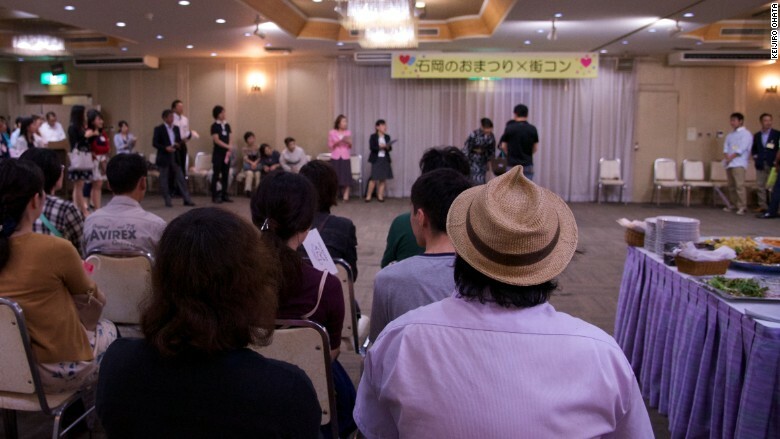 Eight couples paired up by the end of the speed dating event in Ishioka, Japan. Some experts argue, though, that a more equal share of bread-winning and housework duties between the sexes will mean happier men and women -- and therefore, more babies. Setsuya Fukuda, a demographer at the National Institute of Population and Social Security Research, points to the Netherlands and the U.S. as examples that Japan could aim to follow. Both rank among the top 20 in the World Economic Forum's Global Gender Gap index and boast fertility rates far higher than that of Japan, which ranks 101st out of 145 countries on the index. But as Japanese officials can attest, getting people to couple up is no easy matter. Nearly all local governments in the country are trying to play matchmaker these days. 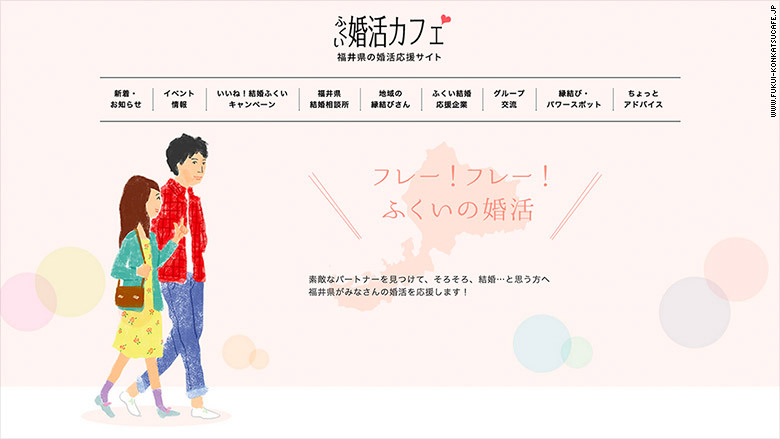 Fukui, a prefecture on the western coast, has hosted an online dating service since 2010, making it a pioneer in government-supported romance. The homepage of the "Fukui Marriage-Hunting Cafe," a government-funded dating website. The prefecture of Hiroshima has managed some degree of success: 15 couples who met through dating events that started last year have since married, and one baby arrived this summer. Pictures of the successful couples are plastered on brochures in Hiroshima as a reminder to singletons to hurry up. Private businesses have also sprung up, such as a dating cram school in Ibaraki prefecture on the eastern coast, where Kyoko Ishiduka counsels singles on how to court each other. "The men are too shy to talk to the women, so I always encourage them," she said. But three years of speed dating in Ishioka has only yielded two married couples. And so the government is trying other options, including a housing stipend for those who marry and free early education for families with at least three children. At the town's recent dating event, eight couples had paired up by the end of the day. "We'd like to go out for dinner first, and start our relationship little by little," said one man, on his way out the door with his new girlfriend. -- With reporting by Keijiro Ohata. Correction: A previous version of this story incorrectly described the place where 15 couples who met through dating events have since married. It was the prefecture of Hiroshima, not the city. This story is part of a series supported by the Abe Fellowship for Journalists, a reporting grant from the Social Science Research Council and the Japan Foundation Center for Global Partnership.